GORHAM—The Southwestern Maine Activities Association held its yearly indoor track championship at USM’s Costello Sports Complex on Saturday, Feb. 9: On the boys’ side of things, Scarborough dominated for the tenth year in a row, more than doubling up on second-place Falmouth’s score, while on the girls’ side of things, Thornton eked out a three-point win over No. 2 finishers Gorham. Westbrooker Nyagoa Bayak continues to dominate in multiple events: Bayak set new Conference records in the High Jump and Triple Jump. Gentlemen Blaze Mahamed Sharif set a new Conference record as well, this one in the 800. Both athletes are nationally ranked, and venture to New Balance Nationals in March. For the Rams, freshman Andrew Farr continues to come on strong (to put it mildly) in the sprints: Farr won the 55, 200 and 400 well ahead of his closest competition. He missed tying Scarborough superstar Jarett Flaker’s (Flaker now participates in the Senior Division) Conference record in the 55 by a mere hundredth (.01) of a second. On the flipside, though, Farr bettered Flaker’s record in the 200 by a whopping eight one-hundredths (.08) of a second. 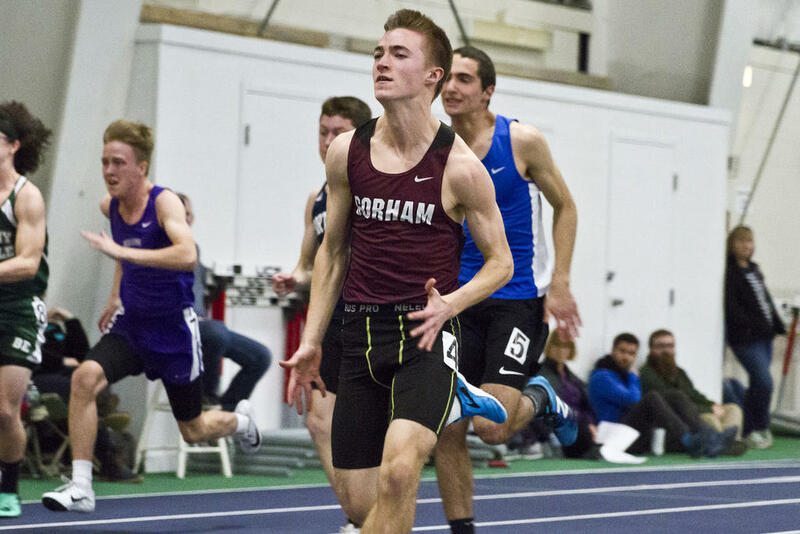 He remains roughly half a second off the standing record, set by Cheverus’s Sean Tompkins, in the 400, but at the rate he’s improving, he’ll probably break that the next time he’s just frantically late for class. Farr’s teammate Ryan Gendron set a new Conference record as well – this one in the High Jump. Farr and Gendron’s elder teammate, Lady Ram Kate Tugman, won all her three events: the 800, Mile and Two Mile. Tugman has, in her years running for Gorham, become quite the formidable force; fans should keep a close eye on her at States next week. Bonny Eagle got great performances out of some recognizable names, like Zack Allocca in the Long and Triple Jumps, and Kayla Raymond in the 600. Katelyn Smith turned in Windham’s best day, with a win in the Triple Jump. Andrew Farr competes in the 55 Finals. Nyagoa Bayak sets a new PR – and a new record – in the Senior Division Girls High Jump. Landon Bickford competes for the Rams. Nolan Davis aims for the pit in the Long Jump. Gorham standout Kate Tugman won all three of the events she competed in. Delaney Hesler competes for the Lady Scots. Bonny Eagle’s Emmaline Pendleton eyeballs a Scarborough competitor. Hunter Vail runs for the Gentlemen Eagles. Jack Pecoraro competes for the Blazes. Sam Cole splashes down for the Eagles. Gorhamite Ryan Gendron set a new conference record in the Junior Division High Jump with this leap. Bonny Eagler Zack Allocca finished second in the Long Jump and won the Triple Jump outright. Chris Hatch runs for Westbrook. Andrew Farr leads in the 400. Ryan Abbotoni soars for the Eagles. Dante Lingley competes in the 55 Finals. Shalyn Bauer competes for the Lady Eagles in the Long Jump. Katelyn Smith vies in the Long Jump. Hannah Kaspereen competes for the Scots. Sydney Connolly competes for Gorham. Meghan Horner long-jumps for Westbrook. Quinn Young jumps for Gorham. Katie Kutzer competes for Gorham. Evelyn Kitchen turned in an excellent meet on Saturday. Alyvia Caruso clears a hurdle in the 55 Hurdles Finals. Cam Holloway clears a hurdle for the Blazes. Emma Noonan competes for the Scots.